Do I have a contract? Is my contract enforceable? These are all questions that our clients sometimes ask. Today’s article will discuss the definition of what a contract is in Georgia. Under Georgia law, O.C.G.A. § 13-1-1, a contract requires: 1. Two parties, 2. An agreement, 3. Agreeing to do or not do a specific thing. O.C.G.A. § 13-3-1 further explains that to constitute a valid contract “there must be parties able to contract.” Additionally a contract requires “a consideration moving to the contract.” Also the parties need to have “assent” to the contract’s terms as well as “subject matter” that a contract is able to operate on. What does all this mean? Let’s take it step by step. The first requirement: the parties must be “able to contract.” This is important because if you do not meet the requirements for being able to contract, the contract could be deemed voidable. For example, a voidable contract would be if your kid is age 16 and he uses a fake id to purchase a Camaro at Crazy Al’s Used Car Lot. As a minor, he would not be able to contract and thus the contract would be deemed voidable, meaning if you, the parent found out about the Camaro you could immediately rescind the contract. Or if he, at age 17, changed his mind and wanted to get out of the contract he could. But, if he turned 18 (the legal age to enter into contracts) and he re-affirmed the contract (i.e. continued making payments on it) then it would in fact be a legal binding contract since he would be within the age of capacity to make a contract. 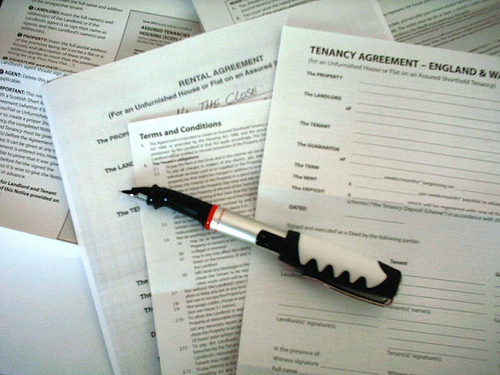 The second requirement: the parties need to have “assent” to the contract’s terms. What does this mean? This means the terms and conditions of the contracts (the requirements and obligations of each party set forth on the document) needs to have been agreed upon by both parties. If for example, one party held a gun to another party’s head and forced them to sign a contract this would not be assent. The contract would not be valid because one of the parties was under duress when forced to sign the contract, therefore the requirement of assent would not be met. Another example is that in order to show “assent” the contract’s terms need to be plainly expressed and explicit enough to clearly show what the parties agreed upon. Therefore if a contract’s terms are incomprehensive or incomplete–a bunch of “gobbelygook” that doesn’t make sense–this type of contract would not be enforced. Patel v. Gingrey Assocs., 196 Ga. App. 203, 395 S.E.2d 595 (1990). The terms need to be certain, clear, definite and precise enough so that neither party could reasonably misunderstand it. Liberty Nat’l Bank & Trust Co. v. Diamond, 229 Ga. 677, 194 S.E.2d 91 (1972). The third requirement: “a consideration” is required in a contract. Consideration is anything of value. The most common type of consideration is money. For example, $200,000 in exchange for a house in a real estate contract or $18000 in exchange for a car in a sales contract are examples of consideration. One party gives something of value (a car or house) and the other party gives something of value (money.) But consideration doesn’t need to be money. It can be something else of value. For example, a promise to do something or not do something is a type of consideration. I promise to paint your house in exchange for you letting me use your swimming pool all year. I promise to give up smoking if you promise to give up drinking. Here, the “something of value” is a promise to not do something rather than do something. The fourth requirement: “subject matter” that a contract can operate on. Finally, a contract always needs to be about something that can be done. Thus, a contract can be “discharged” if it is simply impossible to do it. For example, if you enter into a contract to rent a wedding hall for your big day and it burns down, there is no way the owner can perform his end of the bargain. He may be forced to give you back your money, but he will be discharged due to impossibility if the place you rented is now burned down. There are many examples of how a contract could be discharged (the term of service is over, a party dies, it merges into a new contract) but the point is that all require “subject matter” that a contract can actually operate on. Note that we did not mention a writing requirement. Although a contract many times is required to be in writing depending on what type of contract it is, there are many situations where an oral agreement still is an enforceable as long as the evidence shows an agreement or promise that was made. Mooney v. Mooney, 245 Ga. App. 780, 538 S.E.2d 864 (2000). We will discuss the requirements of whether a contract must be in writing in a future article. Nevertheless, for right now, know that the four general requirements of an explicit contract are: 1. Both parties are legally able to contract. 2. Assent: a mutual meeting of the minds of the parties with the terms of the contract clear. 3. Consideration–anything of value and 4. Subject matter that a contract can operate on. These four major requirements of contract law in Georgia are important to understand because if you are seeking to enforce a contract in Georgia, you need to be able to show that all the essentials of the contract have been met. Associated Muts., Inc. v. Pope Lumber Co., 200 Ga. 487, 37 S.E.2d 393 (1946). For further information on this issue, contact Williams Oinonen LLC at 404-654-0288 to schedule an appointment to discuss your contract.